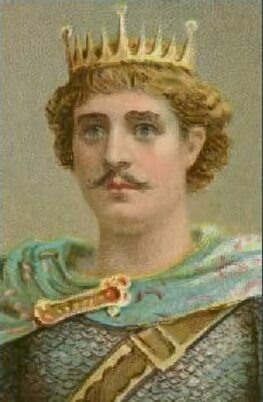 Edred or Eadred, was the son of Edward the Elder by his third wife, Edgiva, daughter of Sieghelm, Ealdorman of Kent. On the death of King Edmund the Elder, the late king's two sons were passed over by the Witan due to their youth, in favour of his brother Edred, who was around twenty-one at the time of his accession to England's throne. Edred was reported to be a small and slightly built man, who suffered from ill-health for most of his life, in the form of a wasting disease which sometimes rendered him unable even to eat. Nevertheless he was a man of considerable courage and resolution. Edred was crowned by Archbishop Oda of Canterbury at Kingston upon Thames, where he appears to have received the submission of Welsh rulers and northern earls The new King further received the submission of the sub-kings of England and the Northumbrian ealdormen at Tanshief, near Pontefract in Yorkshire at the beginning of his reign. The Northumbrian contingent at this meeting was lead by Wulfstan, Archbishop of York. The Viking leader in the north, Harold Fairhair, died and was succeeded as King of Norway, by his son, Eric Bloodaxe. Due to a family conflict, Eric was replaced by his brother Haakon but was later invited to be King of Northumbria. The Northumbrian's and the treacherous Archbishop Wulfstan of York incensed Edred and reneged on their pledges to him, hastening to offer their allegiance to Eric. In response to this threat Edred reacted swiftly, he marched north with an army and ravaged the province, burning Ripon and causing Eric to flee. His rearguard was attacked at Castleford and the incensed Edred turned his army round and ravaged and pillaged Northumbria again. This produced the desired effect of persuading the Northumbrians to abandon the cause of Eric Bloodaxe. The fountainhead of disaffection in the north appears to have been the wily Archbishop Wulfstan of York, Edred captured the troublesome Archbishop in 952 and imprisoned him at his castle of Judanburh. Olaf Sihtricsson was established as King of Nothumbria. After a brief respite, Eric Bloodaxe re-established himself as King of York, but was successfully expelled, he was to be the last of the Viking Kings of York. Eric Bloodaxe was later killed in an ambush at the age of 59, along with five kings from the Hebrides and the two earls of Orkney, on the bleak moors of Stainmore in Teesdale by Maccus, an agent of Oswulf Ealdulfing, the High Reeve or Earl of Bamburgh, who ruled Northumbria north of the Tees. Oswulf was a supporter of Edred, who may have encouraged the murder. 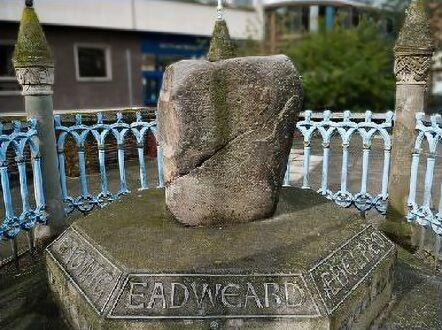 Edred had succeeded in firmly establishing his power in the north of England. The Northumbrian coinage bore his name, clearly declaring his power in the region and he was to be the last of the great warrior Kings of Wessex. Edred helped move the monastic reform movement forward by appointing St. Aethelwold to the Abbacy of Abingdon. The King came under the beneficial influence of St. Dunstan, Abbot of Glastonbury, whom he personally liked. Dunstan was later to become one of the greatest of the Archbishops of Canterbury. On his advice he tried to mediate with the Vikings and did much to encourage learning by supporting Dunstan in the revival of Monasticism. In the last years of his reign Edred delegated much of his authority to St. Dunstan. Over the years, the wasting disease that Edred suffered from caused severe deterioration of his health, he died on 23rd November, St.Clement's Mass Day, 955, only in his thirties, at his palace at Frome in Somerset. As he had never married, he left no direct heir and was succeeded by his nephew, Edwy. Edred was buried amongst his ancestors of the House of Wessex at Winchester Cathedral.